I had an entirely different post planned for today. It’s been a rough week for me, and I’m sure for many others. The physical pain I have battled for over three years decided to attack me with a vengeance again this week. And on these days, all pains begin to hurt. On these days, when I can barely breathe beyond the physical pain, the voices of the bullies decide to take advantage of my weakness. They rise up from the past and start to ridicule, poke, punch, and knock me down again. You are nothing. You are worth nothing. You are ugly. You think you’re a little angel–but you’re NOT! Even though I am surrounded by light, life feels dark. Even though I am blessed with words of love and affirmation, I struggle to believe anything in me is redeemable. I writhe against the pain, battling to believe in the beauty that is me. And even though the physical pain does not yield, the emotional battle must be won. The lies of the bullies were not, are not, and never will be true. We have all been wounded by words, some more than others, and as I fight the lies once again tonight (even as I write this), I wonder if perhaps we can go to battle together…to drown out those voices that sneak in to exacerbate our pains. 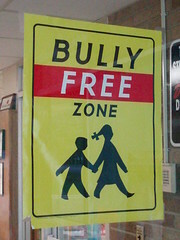 Today, let’s create a bully-free zone in our lives. Let’s speak LOUDLY and OFTEN of the beauty we see in one another. Let’s share the message of healing–the message of love–the message of beauty. Share the video below. God put this video directly in my path last night…because I needed it. I believe you do too. And somebody you know needs it. Watch, allow God to reveal your beauty, and share. So many of us need to hear the message of beauty…over…and over…and over again. Praying for all the wounded, broken, and in pain today. This entry was posted in Beauty from Broken-ness and tagged Art, Beauty, Beauty from brokenness, Beauty minute, Bullying, Christianity, Chronic pain, devotional, God, healing, Linda Crawford, Lord, Love, Pain. Bookmark the permalink.